Plan ahead and add some packages to make your vacation the best one yet. Enjoy drink and beverage packages for unlimited use throughout your cruise. Share your cruise experiences with friends, family and your social network. Get a taste of many of the world-class restaurants on board. And ensure the best moments are captured to keep forever. Prior to APRIL 1st, all travelers are REQUIRED to purchase either Premium Top Shelf Alcohol Package – $65.15 per person / per day, or a Classic Alcohol Package – $51.92 per person / per day or a Non-alcoholic Package – $19.96 per person / per day. This can be done on the Celebrity Cruise Line website using their assigned reservation ID. Want a carefree way to sail with Celebrity? Pay just one price to enjoy a wide variety of beverage choices such as premium spirits, craft cocktails and fine liquors. Wines by the glass, craft & artisanal beers, premium bottled water, Lavazza specialty coffees and assorted teas are just a few of many items to enjoy throughout your Caribbean getaway. 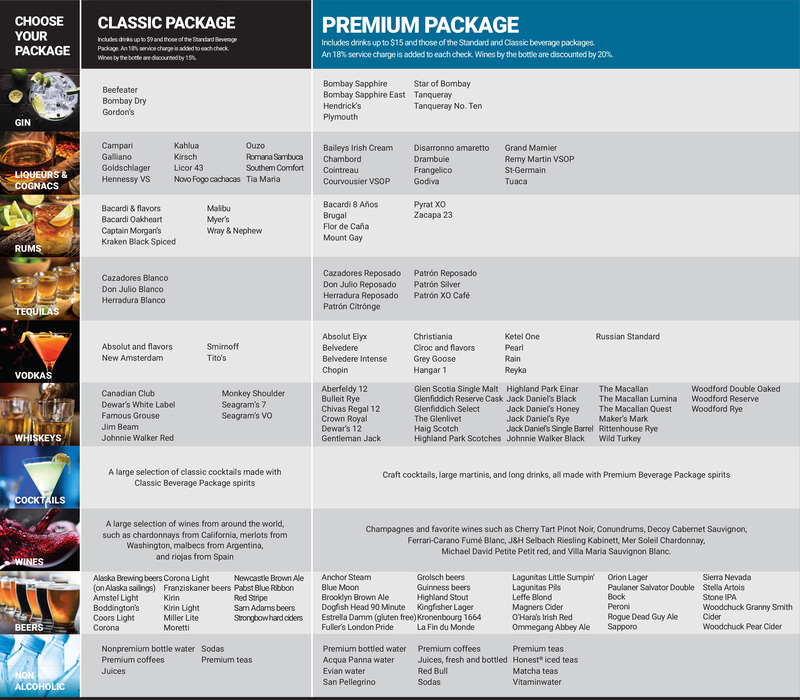 With the Classic alcohol package, beverage choices include select beers, spirits, cocktails and frozen drinks. This package is also accompanied with sodas, bottled water and wines by the glass. Your package can be used in the Main Restaurant, specialty restaurants, casual dining restaurants, and all bars and lounges. Stay refreshed and hydrated throughout your cruise with a wide selection of non-alcoholic refreshments and water. In addition to the Non-Alcoholic Package inclusions, refresh with premium bottled water from Evian, Perrier & San Pellegrino, specialty coffees & organic teas, juices, non-alcoholic frozen drinks & smoothies, Red Bull Energy Drink, canned soft drinks, coconut water and offerings from Vitamin Water. All prices listed are in USD and are subject to change without notice. An 18% service charge will be added to Soda, Wine, Water, Classic, and Premium Package prices at checkout. Package prices may reflect an additional tax for certain ports or itineraries. Packages are sold on a per cruise basis, and not on a per day or any other basis. No refunds will be issued for unused credits. Packages may not be shared, and do not include beverages sold in gift shops, mini-bar, or room service. Purchased packages may be modified up to four days prior to sailing by canceling and reordering the package. Cancellations or refunds will not be issued onboard the vessel after embarkation day. Availability of beverage packages varies by ship. You must be at least 21 years of age to purchase any alcoholic package and to consume alcohol. See the terms of our guest alcohol policy. Other terms and conditions apply.